As reported last year ads running in Q4 tend to underperform the average benchmark in terms of driving ad recall, and this picture is just as pronounced a year later. 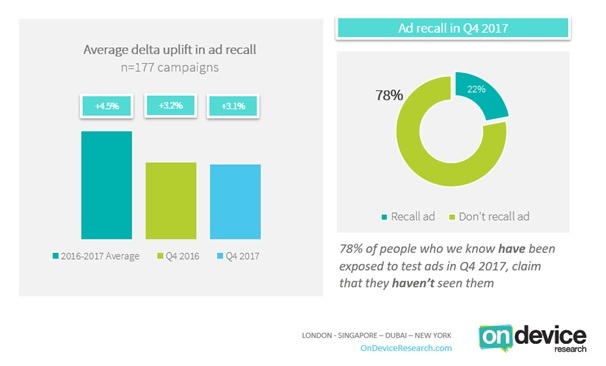 In Q4 2017 the average uplift in ad recall following digital campaign exposure was +3.1% versus a two year average of +4.5%. At a time of high ad clutter ads have to work harder to stick in the consumer consciousness. Overall 78% of the people who we know have been exposed to ads through our passive ad tracking technology, claim that they can’t recall them. The question is therefore, what can brands do to enjoy the brand multiplier of active ad recall (as reported in our passive ad measurement research last month - If you’d like to learn more about how to measure the impact of your digital and cross platform spend, get in touch with the On Device Research team today) at such a commercially vital time of year? High impact formats catch the eye. The brand impact of video on mobile is well documented, but an analysis of those Q4 campaigns that outperformed the Q4 average shows that when combined with full page interstitials and inter-scrollers, an ad experience that sticks in consumer’s minds is created. Seasonal colour palettes help cut through. While many of the best performing Q4 2017 ads were not overtly Christmas campaigns, the majority employed red in their colour palette. The power of colour in influencing consumer behaviour and in particular the psychology of the colour red in driving action, takes on new meaning at Christmas with the added bonus of [red}(http://www.adweek.com/digital/peter-trebek-go-transcript-guest-post-psychology-of-color) being a seasonal colour. If it’s too late to shoot new creative imagery, then a simple red call to action is still worth considering in your digital ads. Make the most of limited creative real estate. Digital ads, especially when viewed on mobile, often do not have the luxury of drawn out storytelling as a creative device. The top performing ads from Q4 2017 featured prominent product shots – many of which appeared as early as the first frame while often occupying at least half of it. Human presence also goes down well – particularly close up shots of the face. As human beings we are primed to respond to the emotions of others and this dynamic can be compounded in the personal ad environment that is our mobile phone.